Allergy Machine Jr Filter FR205. The Allergy Machine Jr. filter utilizes 30 sq. ft. of true medical grade High Efficiency Particulate Arresting (HEPA), the most effective filtering media available, to trap dust, pollen, mold spore and other allergens. 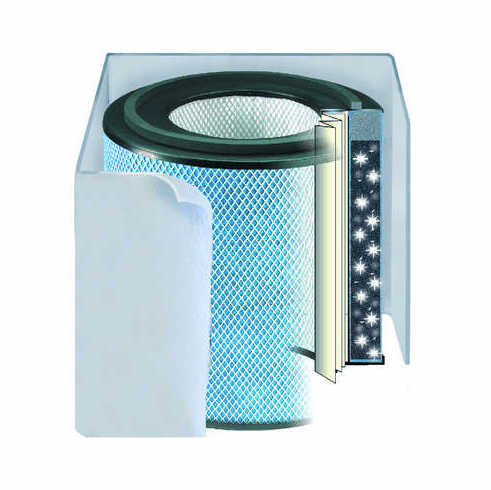 Combined with an activated military carbon cloth to remove odors from pets, smoke, tobacco, gases and other VOC’s, this High Efficiency Gas Absorption (HEGA) filter is able to remove 99.97% of all particles down to 0.3 microns and 95% of minute particles down to 0.1 microns.